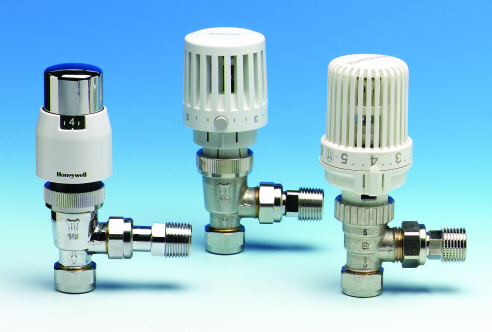 Fitting thermostatic radiator valves (TRVs) to a home central heating system can improve comfort, convenience and energy efficiency by providing temperature control for individual rooms. be turned up when necessary. TRVs are especially useful in bedrooms, conservatories and utility rooms: rooms where occupancy and desired temperatures differ from those in the main living rooms. They also help avoid overheating individual rooms, while allowing the heating system to maintain other rooms at their own set temperatures. Overheating can occur when there are additional heat sources in a room, such as electrical appliances, warmth from the sun (“solar gain”) and fires. And did you know an average adult person emits from 400 to 600 British Thermal Units (Btu) of heat per hour? It’s primarily through breathing and perspiration, but also through radiation. That’s why a bedroom full of teenagers soon gets hot! A TRV will turn off the radiator automatically when the room reaches the set temperature. TRVs are available with a variety of domed and fluted heads. Stylish chrome domed heads are easier to clean, so ensuring the TRV looks good for many years to come. Some models have an energy saving button which causes the adjusting head to pause at that temperature; this warns users against selecting a higher, less economic setting. For better value, packs are available containing both a TRV and a matching lockshield valve (that’s the valve that goes at the opposite end of the radiator to the TRV – it’s adjusted only when the heating system is being balanced). Choose the best mounting position for the TRV to avoid it being affected by draughts or direct sunlight. It needs a good airflow around the TRV head, so don’t put it behind a curtain. And don’t box it in: in one TV home makeover programme they enclosed the radiator with its TRV in an enclosure, so the TRV sensed the temperature within, not the room temperature! Some TRVs have a reversible flow body, and their radiator tail and copper tube connections are interchangeable. So they can be installed with the head vertically or horizontally, and at either end of the radiator, just as you wish – and without causing water hammer. Models with an adjustable tailpiece allow the body to move towards or away from the radiator, which greatly simplifies installation when connecting to existing pipework. When installing TRVs in an existing or new heating system, remember they don’t provide a boiler interlock, so the boiler will fire even when the TRVs are all closed. You must install a room thermostat (or programmable thermostat) linked to the boiler to provide this boiler interlock – but don’t install a TRV in the room where it is installed. You must also install a boiler bypass to provide minimum flow through the boiler when TRVs close while the pump continues to run. Building Regulation Part L specifies that it must include an automatic bypass valve; this maintains boiler efficiency by minimising bypass flow whilst providing a safe flow path through the boiler. This also helps the boiler operate in condensing mode for longer, for more efficient operation. Most existing heating installations will benefit from the addition of TRVs, by saving energy and providing greater comfort and convenience. But when fitting them, remember to follow the guidelines above as well as any provided by the manufacturer, so they operate correctly.